Games with an Egyptian theme have been around since the first days of slot machines. Pyramids with hidden treasures, palaces and pharaohs, and of course Cleopatra, the most famous queen in history. The Cleopatra Slots therefore couldn’t be anything less than the perfect slot machine. Set in the BC era where Cleopatra served as the last Pharaoh of the Egyptian Empire, this slot machine available at Kitty Bingo is all about wealth, gold and well being. The game offers bets from as little as one penny, something that bingo players will appreciate. There are 15 free spins to be won every time three pyramids appear in columns 3, 4 and 5 with an option to win more while in this bonus round (up to 300 free spins). If as a bingo player you are unfamiliar with free spins, it’s a bonus feature in slot machines where you don’t pay for the bet and you usually have the opportunity to win big. The bet amount, which is important as it is multiplied with your winnings is the same as the last bet you placed before you entered the free spins round. But what makes this game amazing is the progressive jackpot. If you can get the Mega Jackpot symbols lined up in your screen then you will become a millionaire. That’s how big the jackpot is. The jackpot amount usually stands at above 2 million pounds, and it can be won with as little as a one penny bet. 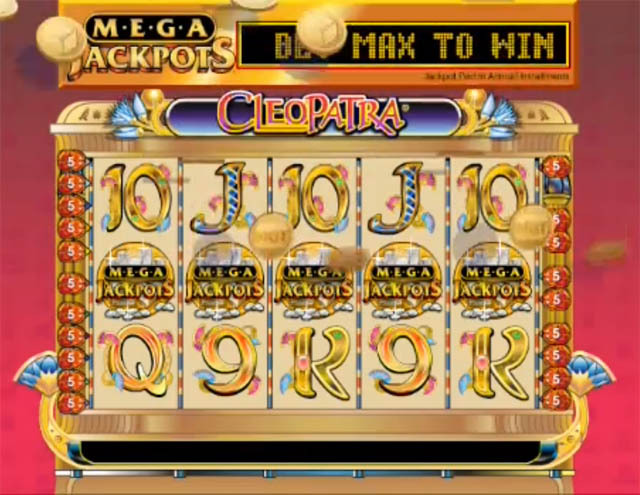 But even if you don’t win the big one, Cleopatra slots offer smaller jackpot as big as 50,000 times your bet per line. If you are online at Kitty Bingo and waiting for your bingo game to start have a go at Cleopatra. You are not risking much, and it might be your lucky day today.